...to put on a wedding, these days. We are totally done with F.E.W stuff: the couple has honeymooned, moved, and this week had an in-state reception hosted by my family. We now have enough leftover pineapple in our basement to see us through the apocalypse. Now we're moving on the Second Ever Wedding(S.E.W.) which, while not until September, is already consuming vast amounts of time. Two family weddings in one year have given me very decided opinions on the "if I ever get married" front: I'm eloping. Best Dance Group Ever: Field Trip to Stuhr Museum happened today. I got sidetracked from my costume gown to theater costumes. Besides the S.E.W. 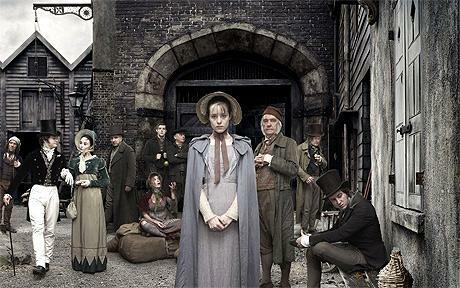 there's also the Providential History Festival this September. There are always costume needs for PHF. This year I'm sewing six romantic-era dresses. With that excuse I've enjoyed watching the period-appropriate mini-series "Wives and Daughters" with this week's hand sewing. Next week I have my first fitting day for the guys who will be renting my costumes, so repairs and labels are in order. Hopefully my fabric will come in the mail and especially with it being a holiday weekend I hope to get more sewing done before the ladies' fitting day the week after. Little girls' drawers. These are an experimental pair. I've wanted to experiment with drawers for a while, but more to the point there's a Romantic-era play coming up in September, and any sewing I do for that had better happen soon, because after this gown bridesmaids dresses are priority. So anyway, I was thinking about the romantic era and I made drawers. Back to the gown, apparently some really great costume copies of Elizabeth's dress have been done before: The Art of Clothes' blogpost from 2012 is a great overview. I haven't decided how I'm going to trim mine yet, but it needs to be something rustic yet pirately-daring. 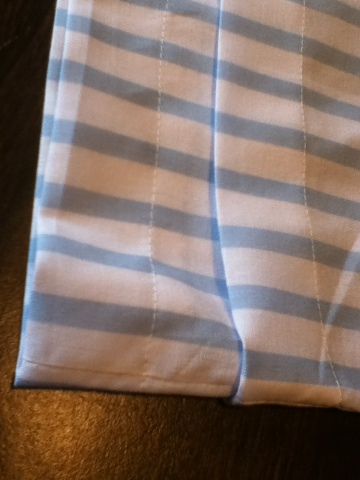 3/4 inch pleats. 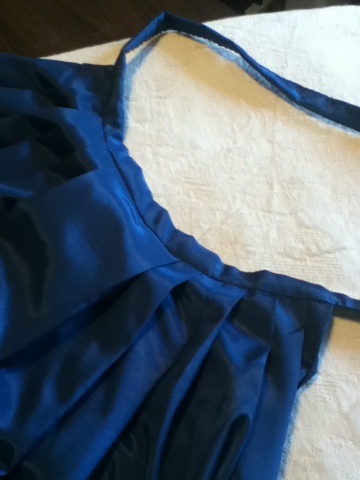 This fabric is nice and shimmery, but very thin and lightweight for a petticoat. I got most of the petticoat done yesterday, and finished the hem today. As usual, I'm doing hidden seams by machine and visible stitches by hand. My (other) Grandma is trying to clean her house(wrenching things away from Grandma is like screeching fingernails on rock as a person slips screaming over a precipice) and clean out her craft area, so some months ago she gave me an enormous bolt of a rough cream-colored cotton fabric with a damask design. There's got to be at least ten yards of it, and I'm guessing it was meant for a drapery or upholstery project. I also bought three yards of some remnant home decor fabric. It's some sort of poly/cotton blend in a deep turquoise sateen, perfect for a dramatic costume. What kind of costume, you ask? 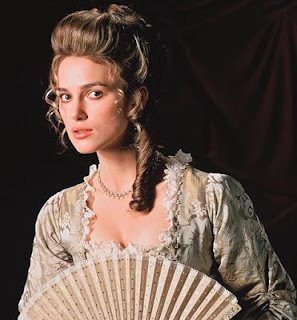 Elizabeth is mostly in her underwear throughout the movie, and I won't comment on any historical inaccuracies in the costumes, but those issues aside I've always enjoyed the outfits in this movie. "Curse of the Black Pearl" was released when I was fifteen, and it was such a craze that three years later my graduating class used the POTC theme song as our recessional. Elizabeth's dress looks to be a satin brocade, open-front gown with stomacher and loose, cuffed sleeves with fine white shift ruffles showing around the neckline and sleevehem. 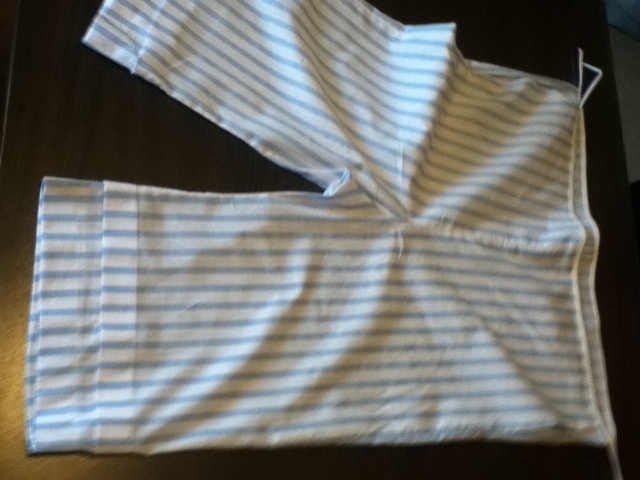 There seems to be some sort of decorative knotted trim or buttons down the sides of the front opening. The under-petticoat is a paler patterned fabric, maybe even a satin quilted petticoat. My goal is to make a open-front gown with the cream fabric, with a teal petticoat and matching stomacher(though three yards of teal may not be enough). 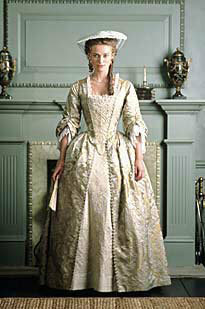 Obviously any gown I make will look quite different from Elizabeth's in that I have different fabric, but I'd like to capture the same idea and style. It's a heavy cotton, and I imagine the material will hang something like this cool looking petticoat. Sooo... I have the fabric, I have the idea, now for the work! This past week the family's been down in the rebel state of Texas for the First Ever Wedding. Everything went off without a hitch and the weather was just right. It was an outdoor wedding on a private residence, and the whole church pitched in to make a gorgeous meal and lovely decorations. You'll just have to take my word for it, though, because I didn't take any pictures at the wedding. I did take a few pictures at the blankety-blank museum when we visited. It's not a super large museum, but there were some very neat dresses in the collection. As usual the lighting was kept very low so as to preserve the fabrics, so I got way fewer photos than I would have liked. If I ever have children, I'm going to dress them in history. Most of the dresses on display were formal. There were several silks, like this one above. There were probably less than five everyday outfits, including a swimsuit, a wool suit, and a light cotton sporting dress. The ladies' collection had about forty women's and children's gowns on display, loosely covering the time from the "ahem" war to 1890. There were two of those startlingly bright purple gowns, and one impressive black silk embroidered gown with leg o' mutton sleeves. Victorian trim is amazing. This celery green dress had those teeny pleats not only around the cuffs, but the entire hemline. This dress was special made for some official's lady- I can't recall who. Bustles. Amazing yet ghastly. I simply cannot imagine why a practical person would embrace a fashion that uses insurmountable yards of fabric, and must be an absolute horror to wash and iron. I am thankful, since I am a practical person, that I was not born in that era. Instead I was born into the era of ultra-blah clothing, so I can look back and choose to recreate any era I please!